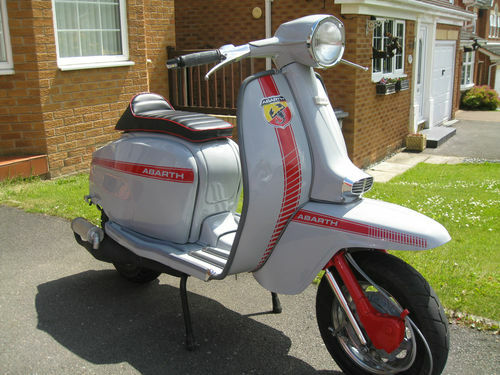 Another couple of nice scoots on eBay at the moment… if you like auto’s that is. Ok… they are not everybody’s cup of tea… especially the purists… but were a broad church here at Lambrettista, and I don’t mind them. After all… where does ‘tuning’ stop. 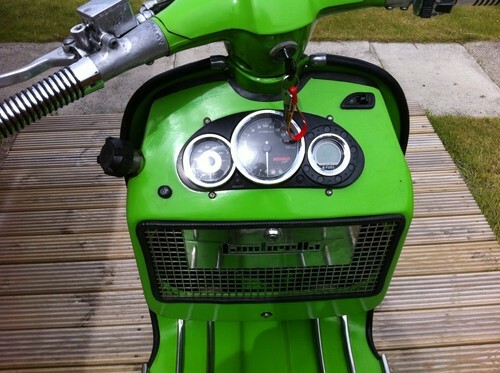 And if you can get “Lammie looks with automatic reliability” which is often the way these things are sold… well… why not. Anyway. on to the machines. 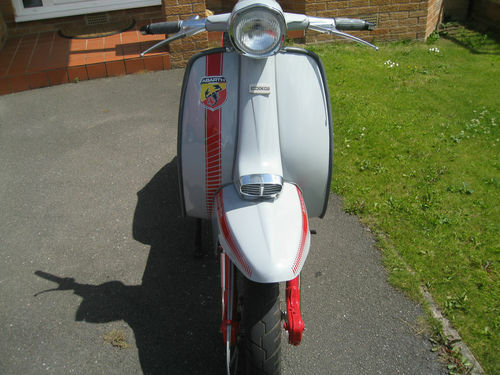 Bike one is the more classic Lambretta looking scoot… Classic SX good looks with a very smart Abarth paint job and a Typhoon 125 power unit. A nice touch is the bar end indicators. Neatly done. It’s had a few bids, but if your desperate to get your hands on it, the buy it now price is £4000. Here’s the link. The second bike is a bit more radical… and there’s a bit of an issue with the photo’s on eBay, so maybe you can see them here and then stick your bid in if your interested. 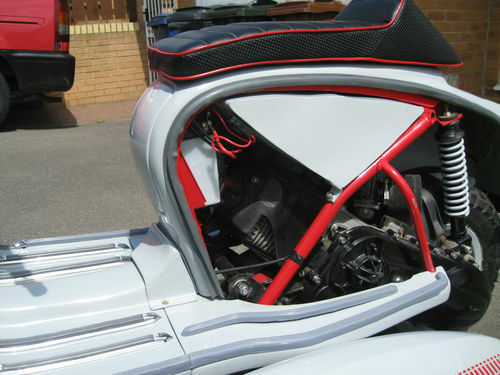 Built on a Lambretta Innovations frame, it runs on 13″ wheels. 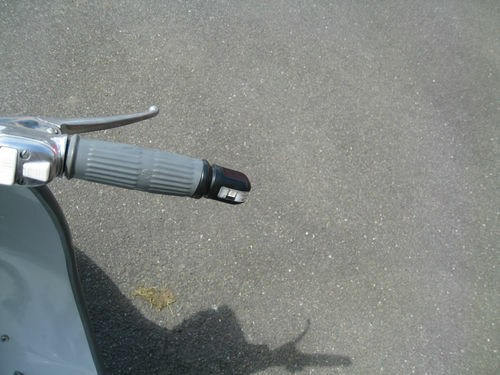 The power is provided by a Gilera lump with a Mallosi 172 top end. It will (allegedly) “sit at 80mph all day long” and has all round disc brakes to bring you to a swift halt if the need arises. 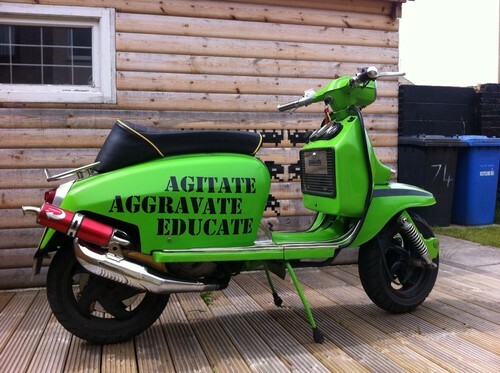 If Kawasaki Green and a swift ride is your thing, you might want to get a bid in on this scoot. Here it is on eBay. Even if you’re not interested, and you’ve got five minutes, check it out because it’s written in a thoroughly engaging style. I like what he’s done with the shed, too. My only caveat about autos is, being a hybrid, when things go wrong… where do you take it? 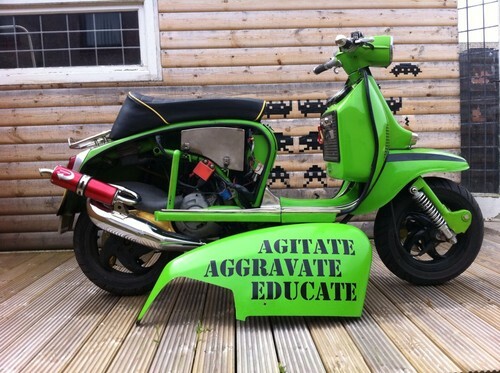 A Lambretta specialist? A Gilera (or whoever has made the engine) specialist? Hopefully back to the place that built it. But the permutations of things that could go wrong rise rapidly. Saying that, if you’re even thinking about it, your probably a little handy with the spanners yourself, and a little tinkering may not worry you. If that’s the case, go for it. 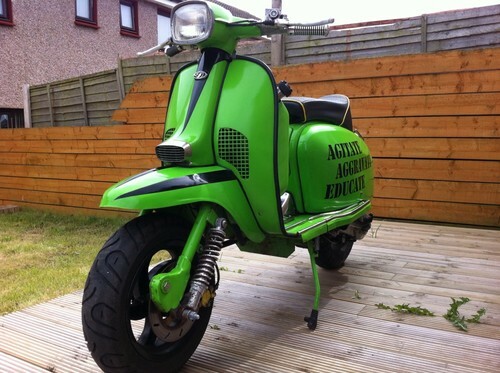 This entry was posted in Customisation, For Sale, Not a Lambretta and tagged Auction, auto, custom, eBay, Gilera, Kawasaki, Lambretta, Lammie, modified, Typhoon by crocodilejock. Bookmark the permalink.